Hello holiday friends. I saw this adorable rustic Christmas village in the Lowes Creative Ideas magazine. I took a slightly different spin on it. 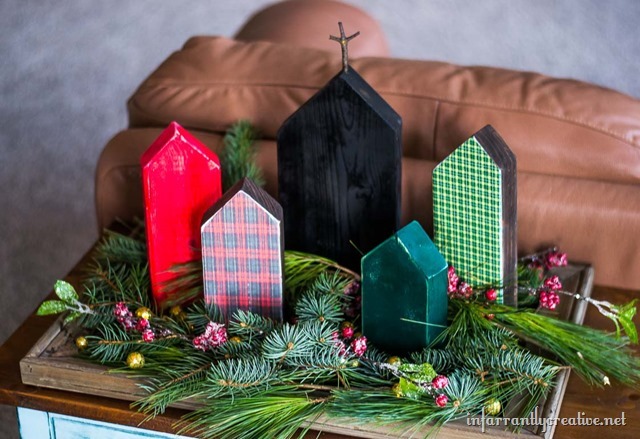 Cut 2x4s to resemble houses, apartments, buildings, or churches, and this little village is sure to look cute on a mantel, accent table or act as a centerpiece on your holiday table. It is a great way to use up some of those scrap pieces of wood lying in your garage. 1. Roughly measure how tall you want your buildings to sit. Then cut your angles at 45 degrees. They don’t have to be perfect. A little crooked adds a little more whimsy. 2. I chose to paint three of them with spray paint. I used Krylon Chalkboard spray, Krylon Banner Red, and Evergreen. Optional: If you want more of a distressed look you can take some sandpaper to the sides to sand off some of the paint once it is dry. 3. On two of them, I stained them with Rustoleum Kona. Once dry, I used Mod Podge to adhere the plaid scrapbook paper to the wood piece. 4. On the tall chalkboard building, I decided to turn it into a church. I found a branch that looked cross-like and drilled a hole into the top of the wood and stuck the branch down in there. 5. Then I arranged the village on top of my frame and added some evergreen and pine clippings from my yard (good ole Ohio trees!). 6. I cut some of the berry pick and arranged them on there as well. I had some gold sparkle filler I added for a little more sparkle. What Christmas projects do you have planned for the holidays? If you need more DIY Christmas ideas, visit my Pinterest board DIY Christmas Ideas. Or if you need help planning your Christmas menu, I have a lot of great recipes on the Christmas and Baking recipes Pinterest board too!